On the toolbar, click the Create a Text Box button. Move into the workspace. Drag the mouse anywhere on the workspace to draw a medium-sized rectangle, creating the text box. A text box called text1 appears in the workspace. Click inside the text box. Type a title — Art Toy — in the white area of the text box. Use the mouse to select (highlight) the text inside the text box. The text can now be formatted. Note that the Windows menu options for formatting text may vary slightly from Mac menu options described here. From the menu bar, choose Text→Font and choose a font from the pop-up menu of fonts. Choose Text→Size to choose a text size for your title. Choose Text→Style to choose a text style for your title from the pop-up menu. Options consist of Plain, Bold, Italic, and Underline. A Colors dialog box appears. 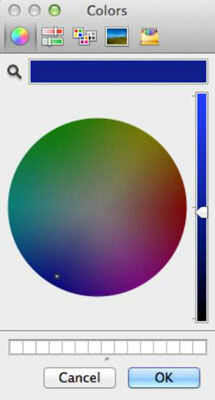 Move the slider, which is on the right, and click a color on the color wheel to choose a text color for your title. Click OK to apply the color to your text title. If needed, resize your text box to better fit the text you type inside it. 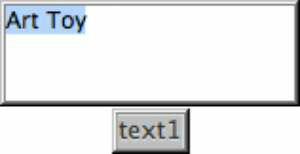 Ctrl-click (Windows) or Command-click (Mac) outside the text box and drag over a side of the text box. Sizing dots appear — click and drag any of them to resize the text box. Right-click (Windows) or Ctrl-click (Mac) inside the title text box and select Transparent from the pop-up menu. Making the text box transparent makes the text inside the box visible and the box itself invisible. Click your title text and drag it into a position in the workspace where you would like to place the title. You can edit text only when the text box is opaque (not transparent). To change a text box from transparent to opaque, right-click (Windows) or Ctrl-click (Mac) the text and select Opaque from the pop-up menu.